Takoradi is situated in the Western Region of Ghana. The Western Region is famous for having the best beaches in Ghana and some of the finest tourist sites. The forts and castles that Ghana is famous for is barely an hour’s drive away from Planter’s Lodge. 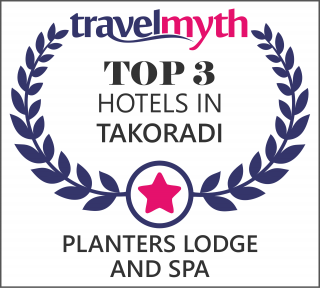 Planter’s Lodge is in Takoradi, and is set in Beach Road, which is the most sought after residential area. Our location offers guests a peaceful and tranquil setting even though the hotel is a few minutes drive away from the city. British Airways awarded Kakum Forest Reserve a Heritage Award a few years ago. At Kakum, it is possible to experience a canopy walk. This is positioned on top of the rain forest and lends itself to breathtaking panoramic views of the jungle below. Again, this is one hour, fifteen minutes drive away from the hotel and not far from the forts and castles. The ‘village in the lake’ is Nzulezu. This is a two hour drive from Takoradi. Stephen, a local guide who looks after our guests, will take you in his canoe to the village. A gift of a bottle of schnapps is quite customary for the chief of Nzulezu who will regale you with stories of how the villagers came to settle ‘in the water’. Our chef will pack you a picnic of lovely ‘cold chop’ if he is given advance notice. We recommend you drive to Ankobra Beach Resort for your lunch (they will allow you to do so if you buy a few cold beers) after your sojourn to Nzulezu. Copyright © 2014 Planters Lodge & Spa. All Rights Reserved.